Happy New Year and welcome back! I hope you enjoyed your holiday break with family and friends. As I experienced my first few days as superintendent I am very grateful for the support and well wishes I have received. Our focus as a district will always be the children and families we serve, but I also put great stock in our work family. People are our greatest asset and we are blessed to have an amazing team throughout the district. I look forward in the coming weeks and months to spending time in our schools and getting to talk with not only students, teachers and administrators, but also support personnel and school staff. Children are why we do what we do and I will never lose sight of that. Dr. Joyner has sustained an exceptional school district for 14 years and has left me with big shoes to fill. I look forward to growing as a leader and as a district over the years while we prepare our students for the future. I am honored to serve as your superintendent and look forward to working together to prepare every student for the future. My second day on the job was filled with celebration as I had the pleasure of surprising the five finalists for St. Johns County Teacher of the Year. I know the judges had a very tough choice this year so please join me in congratulating the best of the best: Jennifer Cooper of Pacetti Bay Middle School, Dana Kelly of Cunningham Creek Elementary, Lauren Tate Wade of Ocean Palms Elementary, Ryan Sirak of St. Johns Technical High School and Anje Newbold of Otis A. Mason Elementary. This is just a small sample of the individuals we are so fortunate to have teaching our children and I am forever amazed at the dedication and professionalism of them all. It will be my honor to recognize these exceptional finalists, and all of our Teachers of the Year, at the 37th annual Teacher of the Year celebration Monday, January 23 at the Renaissance World Golf Village Resort. The overall winner will be announced at this banquet and will then be included for consideration as the Florida Department of Education Macy’s Teacher of the Year 2018. The Rookie Teacher of the Year will also be announced at the awards banquet. This is the 10th year for the rookie award, in which eligible teachers must have taught fewer than three years. Don’t forget to register for the CHARACTER COUNTS! 6 Pillars 6K/3K Run/Walk Saturday, February 4 at 9 a.m. at Palencia Elementary School. This event provides an excellent opportunity to celebrate the great character in our community. Online registration is available at www.racesmith.com/races/CHARACTERCOUNTS.html. Race proceeds support CHARACTER COUNTS! initiatives throughout the St. Johns County School District. The run/walk is open to all ages, and the top three winners will be awarded in each of the age categories as well as the overall male and female finishers. A cash donation will be awarded to the top three schools with the most registrants. Race participants who preregister will receive a tech t-shirt and other goodies from area businesses and organizations. At the finish line, each race participant will receive a commemorative dog tag which is the third design in its series. There are several other events occurring in the coming weeks which highlight the accomplishments of our students. The St. Johns County Spelling Bee is Wednesday, January 18 at the FCTC CHARACTER COUNTS Conference Center; the High School Showcase at the Renaissance at World Golf Village is January 19 from 3:30-7 p.m. and the school district’s annual Science Fair is Wednesday, February 1 at the First Coast Technical College (FCTC) CHARACTER COUNTS! Conference Center from 9 a.m.-noon. On behalf of the School Board and staff of the St. Johns County School District, I want to wish you all a Merry Christmas and the happiest of holiday seasons. This is a wonderful time of year in our schools, happy students, teachers and staff working hard every day while eagerly anticipating a well-deserved break. For me, the most rewarding aspect of the season is the spirit of giving. As you can see from the story below, The Hugs Across the County organization involved multiple schools and filled close to 250 food bags for those in need. Additionally, the support for our ASSIST Program, which helps to support our homeless children and their families, has been at an all-time high with district staff raising over $9,700! It is gratifying to see such selfless support for those in need, especially at this time of year. Since this is my last message in this publication as superintendent, I want to once again thank the School Board, parents, teachers, support staff and community members who have allowed me to serve as superintendent. Our school district is in excellent hands with Tim Forson, and I am certain that his tenure will be as personally rewarding as mine has been. St. Johns County is a very special place because of all of you, and I will be eternally grateful for the honor of serving as your superintendent the last 14 years. May the peace of the season cover us all and renew our faith. The goal of Hugs Across the County was to make winter break food bags for 160 students identified by guidance counselors and the ASSIST program who are especially vulnerable this time of year. These are all students who are not already receiving assistance from other organizations. Thanks to so many caring people in the school district, that goal was exceeded and close to 250 bags were filled! The food bags, chock full of kid-friendly breakfast and lunch items, were delivered for students at W.D. Hartley, Hickory Creek, Palencia, Durbin Creek and Otis A. Mason elementary schools, Switzerland Point, Gamble Rogers, and R.J. Murray middle schools, Bartram Trail and Ponte Vedra high schools as well as ASSIST. In addition, so much extra food was collected, that Hugs Across the County was able to fill a room at Gamble Rogers Middle School so that weekend food bags could be filled for 54 of its students. Special thanks to everyone who helped collect, bag and distribute food to some of our neediest students during this holiday season. The district continues to monitor enrollment numbers for the 2016-2017 school year. Currently, there are 38,666 students enrolled in the district. This represents a growth of approximately 5.6 percent. The district also achieved compliance with the Class Size Amendment for all core classes for the established limit based on grade level (Grades KG-3: 18; Grades 4-8: 22; and Grades 9-12: 25). At their December 13 meeting, the School Board approved changes to the attendance zones. There was one change for the 2016-2017 school year that is effective immediately. This action rezones the townhouses known as the Palisades at Durbin Crossing from Patriot Oaks Academy to Durbin Creek Elementary and Fruit Cove Middle School. These units are not yet occupied. The School Board also created an attendance zone for Elementary M and adjusted the zones at several area elementary schools to balance enrollment and better address growth for the 2017-2018 school year. The schools affected are Mill Creek Elementary, Wards Creek Elementary, Palencia Elementary, Ketterlinus Elementary and The Webster School. Detailed information on these changes is outlined on the district website. Please visit www.stjohns.k12.fl.us/zoning/. Following the November 8 election, more than 60 new representatives and senators were sworn into office in the Florida State Legislature. In preparation for the 2017 Regular Legislative Session, committee membership has been announced, trainings have been taking place for new members, and the first week of interim committee meeting took place in the Senate the week of December 12. To view a complete calendar of committee meetings and session dates, as well as find committee membership lists, contact information and additional advocacy resources, including a copy of the district’s legislative platform, please visit our website at www.stjohns.k12.fl.us/gr. As the district prepares for what is sure to be a tight budget year for the state and competing priorities between the House and the Senate, your involvement in the process is more important than ever. Governmental Relations has also been working to involve more administrators, teachers and parents in advocating for the district. If you have a group of faculty or a PTO who would like more information on how to effectively communicate with elected officials and advocate for the priorities of the district, please contact Beth Sweeny, Coordinator for Governmental Relations, via email at [email protected] or telephone at 547-7673 to set up a presentation. Wednesday, December 21 is a regular early release day, Elementary at 1:50 p.m. and Middle at 1 p.m.
High schools will dismiss at 11:25 a.m. due to the exam schedule. Winter Break begins Thursday, December 22 and ends Tuesday, January 3, 2017. Wednesday, January 4, 2017 is a district-wide inservice day and student holiday. Classes resume for all students on Thursday, January 5, 2017. The District Spelling Bee will be held on Wednesday, January 18, 2017, at 9 a.m. at First Coast Technical College, Bldg. C, located at 2980 Collins Ave., St. Augustine. The annual Teacher of the Year Celebration is designed to honor outstanding teachers who play a thoughtful, caring, and influential role in the lives of students. This year’s theme is “All Star Teachers.” The sports-themed celebration will be held on Monday, January 23, 2017, from 6-9 p.m. at the Renaissance® World Golf Village Resort. The cost is $45 per guest and includes dinner and awards. Register or sponsor via the website at www.ink-stjohns.org. The Regional Science Fair is Wednesday, February 1, 2017, at First Coast Technical College, Bldg. C, located at 2980 Collins Ave., St. Augustine. Exhibit Hall viewing will be February 1, 2017. Parents are welcome to view projects/take pictures between 8:15-8:45 a.m. prior to the start of judging. Project pick up is February 1, 2:30-4:30 p.m. or after awards on February 2. The awards ceremony is scheduled for Thursday, February 2, 2017, at 6:30 p.m. All events will be held at First Coast Technical College. The fifth annual CHARACTER COUNTS! Six Pillars 6K/3K Run Walk is on Saturday, February 4, 2017, at 9 a.m. at Palencia Elementary School, 355 Palencia Village Dr. Register online at www.racesmith.com. Register by January 14, 2017, to guarantee a run t-shirt. Three fifth-grade students approached School Nurse Jean Drayovitch, RN, BS, about doing an enrichment program with the school’s health clinic. The five-week program covers topics on 911 Skills/Dispatch, Food Labels/Nutrition Eat This-Not That, Playground Safety, First Aid Kits, and Basic First Aid review. In a demonstration of leadership, proactive initiative and dedication, the three students gave up recess time to participate. Nurse Drayovitch and the students wrote to the St. Johns County Sheriff’s Office and invited a dispatcher as a guest speaker in their classroom. 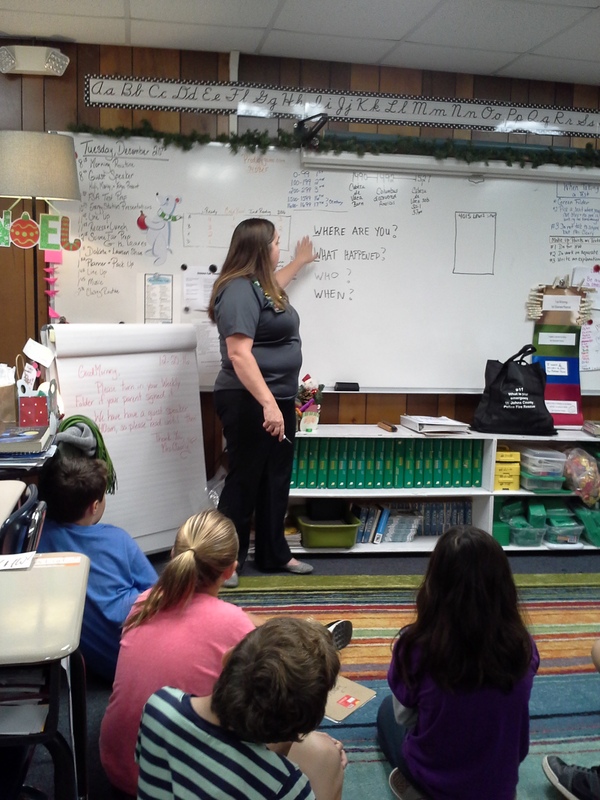 911 Disptacher Stephanie Phelps spoke to Ms. Cleary’s fifth-grade class to review 911 skills and play a Q&A game to win 911-themed goodie bags and prizes. Students learned the importance of what/where/when for giving information, the skill for identifying the address where you are staying/visiting/living and best practices for what to do if you accidentally dial 911. The students were also introduced to new technology available for texting to 911. The 37th Matanzas 5000 5K and Fun Run is January 21, 2017. Proceeds from this event go to support cross country teams at St. Johns County high schools and middle schools. The Matanzas 5000 has raised over $100,000 for running programs in St. Johns County schools! Early registration for $25 through January 1st. New this year – a long sleeve tech shirt for first 1,200 registered. For race entry, Race Expo and sponsorship information, please visit www.matanzas5k.com or on Facebook at https://www.facebook.com/Matanzas5K. The city of St. Augustine Beach is currently seeking volunteers to work the New Year’s Eve Beach Blast Off on Saturday, December 31. Two shifts are available: 3-7 p.m. or 6-10 p.m. and includes food and drinks, a t-shirt, a drawstring bag, 10 tickets ($10 value) and community service hours. Sign up to volunteer at sabevents.com/help or call (904) 669-5670. It is an honor for me to welcome and introduce to you our new Superintendent for the St. Johns County School District, Mr. Tim Forson! Tim is an outstanding educational leader who I have had the pleasure to work with over the past 14 years, and I personally do not think the Board could have made a better choice for the future of our school district. As a teacher, coach and administrator in St. Johns County, Mr. Forson has a broad range of experience in all areas and is more than qualified and prepared to assume the role of Superintendent of Schools. His long tenure as a principal at multiple levels gives him a unique understanding in curriculum, instruction and assessment for all students while his work as deputy superintendent of Operations ensures a smooth transition in leading a complex organization. Most importantly, Tim is a person of high moral character and integrity. His values are consistent with those of the school district and he displays them daily in his work and in the manner in which he interacts with staff, parents and students. Additionally, Tim has exceptional judgment, discernment and foresight. As a native St. Augustinian, he has great respect in the community and is constantly sought out for advice. The past 14 years as Superintendent of Schools have been the highlight of my professional career and I want to express my sincere gratitude to all of the students, parents, teachers, support staff, board members and community who have allowed me to serve in this capacity. It gives me tremendous comfort and peace to know Tim Forson will be leading our school district to the next level of excellence! The IT Department has completed the upgrade of most (if not all) student computers and tablets (that are capable) from Windows 7 or 8.1 to Windows 10. Windows 10 is the latest version from Microsoft that contains several new features and supports increased security measures. We are working to roll-out a Windows 10 upgrade plan for teacher machines that should take place in early 2017. All new teacher and administrative computers that are distributed this school year have Windows 10 installed. The Technology Support Specialist (TSS) at each school will help teachers perform this upgrade when it becomes available. The IT Department is planning to upgrade BusinessPlus from 7.9.9 to 7.9.10 in February 2017. This upgrade will bring more functionality to District BusinessPlus users. The video production team continues to assist the district’s career specialists with their Programs of Choice videos as well as gearing up for the Jim Harbin Contest which features local students’ own video productions in categories ranging from comedy to book trailer. The deadline for entry in this contest is March 10, 2017. The department recently completed installation of the remaining Amino Tuners at Patriot Oaks and Valley Ridge academies giving them the capability to broadcast their own local television signal throughout the entire school. Community Relations looks forward to seeing what the broadcast teams can produce as the district takes great pride in the video production work done by all St. Johns County students. Working with Human Resources, the Community Relations Department recently relaunched a website which allows newly hired employees to learn about school district programs and policies from home through a brief online course. The new website includes updated video presentations and a simplified design which is compatible with a wide range of devices. The district webmaster has also been working closely with the Information Technology Department to improve the performance of the main school district website and significantly decrease the time it takes to load for end users. In the coming months, these same techniques will be applied to school websites to improve their performance as well. In October 2007, the NFL launched NFL Play 60, a national youth health and fitness campaigned focused on increasing the wellness of young fans by encouraging them to be active for at least 60 minutes per day. During the 2016- 2017 school year, Alice B. Landrum, Gamble Rodgers and Sebastian middle schools, St. Johns Technical High School and Valley Ridge Academy opted to have their sixth-grade students participate in this program. Several of the participating schools earned the opportunity to attend the NFL Play 60 football game. Gamble Rogers Middle School was selected to receive the Play 60 Challenge school visit that includes an active assembly for their entire sixth grade population involving program directors, cheerleaders and a Jaguars player. The Community Relations Department is available to help facilitate school partnerships among one another and with outside organizations and businesses. To date, partnerships have been created to fulfill needs including food, clothing, supplies, books, monetary and in-kind donations. Kelly Thigpen, the district coordinator for character education and community partnership, has been assisting teachers across the district by teaching and creating fun and engaging CHARACTER COUNTS! lessons that infuse their state standards with character education. CC! the Pillar has also been traveling each week to celebrate the awesome character and student leadership that is taking place on campuses throughout the district. Outstanding school volunteers in the youth, adult, and senior categories have been selected. The district winners have been chosen, and will be announced at the annual Outstanding School Volunteer and Volunteer Coordinator reception on April 6, 2017. These amazing individuals represent over 16,000 volunteers in the SJCSD who support schools throughout the district. Volunteers from RSVP will play a major role in the St. Augustine Bed & Breakfast Tour of Inns on December 10 and 11, benefiting a local charity. A holiday recognition breakfast will be held for RSVP members December 13. Volunteers continue to mentor and tutor students in grades kindergarten through 12, and provide literacy enhancement opportunities to preschool students in the district’s early childhood program and local childcare facilities. Last year over 600 students received specialized service from RSVP volunteers. Mark your calendars now for Chocolate and Beyond, a delicious and exciting fundraiser for the RSVP program. This will take place Saturday, February 25, 2017, at First Coast Technical College from 2 – 4 p.m.
For information regarding volunteer opportunities and/or Chocolate and Beyond, call the RSVP/Volunteer Services office at 904-547-3945. Wednesday, December 21 is a regular early release day, Elementary at 1:50 p.m.; Middle at 1 p.m.; High at 2:45 p.m. The fifth annual Santa Suits on the Loose 5K, presented by Bozard Ford and Island Doctors to benefit St. Augustine Youth Services (SAYS), is a walk/jog/run that will be held December 10 starting at the St. Augustine Beach Pier Park at 8 a.m. The race follows a flat 3.1 mile course through St. Augustine Beach neighborhoods. Registration begins at 6:30 a.m., and entry fee is $35 per person. There is a choice of a Santa Suit or Santa-inspired t-shirt. Go to www.sayskids.org/santa for more information. Again this year is the Community and Corporate Team Challenge. You can gather your neighbors, co-workers, friend and relatives to form a team. Receive bragging rights and a traveling trophy for registering the most participants. For more information or to register online, visit www.racesmith.com or email [email protected] for any questions. SAYS is a residential therapeutic group home for boys ages 6-17 who have experienced emotional trauma or abuse, and is celebrating 27 years of serving children. Thanksgiving always reinforces the gratitude I feel at being able to serve with so many caring and selfless individuals. It is a blessing to have the opportunity to work for an institution whose sole purpose is to serve children and every day I am reminded of acts of kindness by a teacher or member of our support staff. I hold a firm belief that gratitude should – and must – be taught to children. The countless examples of programs honoring veterans, the clothing and food drives for those less fortunate, and the donations that poured in following Hurricane Matthew, are a testament to the great work our schools do in teaching gratitude. The recent dedication of our principals and all of our amazing staff who worked so tirelessly at our school shelters during the hurricane is an example of the trust our community places in our school district, and I am very grateful for their work. We are so fortunate to have people rise above during challenging times to meet the needs of our children and families and exhibit great character throughout the county. We never take for granted the outstanding parents, teachers, staff, school board members and students who make this school system the great place it is to work and learn, so thank you for all you do. This week ushers in the “holiday season” for schools and it is my favorite time of the year. May God bless all of you and your families this Thanksgiving, and may you have a safe and restful holiday! Crookshank Elementary School (CES) hosted 25 veterans of foreign wars joined by 880 preschool through fifth-grade students earlier this month to honor the men and women who serve in our armed forces and protect American freedoms. All veterans in attendance were introduced to the children and several chose to speak about their experiences, including a World War II veteran who was present at the D-Day invasion. Members of the safety patrol respectfully raised a flag that flew over a Iraq and led all students and visitors in reciting the Pledge of Allegiance. The CES chorus sang the national anthem and the patriotic song, “American Tears.” The 2016 Veterans Day observance was the school’s largest to date. Following the Veterans Day celebration, Superintendent Dr. Joseph Joyner and School Board Chair Patrick Canan spoke to students about the decision to build a new 22-room building at CES. The building more than doubles the interior space at the school. Students were invited to participate in drawing and essay contests and the winners shared their pictures and essays with the crowd. With two buildings now on campus, a contest to name each of the buildings was held and a vote taken. The historical 1959 building was named the “Cub Den” and the new intermediate building, the “Cougar Den.” Everyone enjoyed refreshments and tour after the ceremonies. St. Augustine Artist Manila Clough has spent a good part of the last two years creating a large porcelain and stained glass mosaic for the Crookshank student body. The mosaic is titled, “We are Made of Starstuff” a Carl Sagan quote meant to inspire wonder about our experience of life. The afternoon of the Veterans Day/Building Dedication ceremonies, Mrs. Clough’s mosaic was unveiled and children and adults marveled at the beauty and intricacy of her work. Manila will be volunteering as an artist-in-residence at CES during the second semester. All of us are very grateful for her special interest in our students. The Durbin Creek Elementary School (DCES) chorus will be performing at the Jacksonville airport Tuesday, December 13 at 11:30 a.m. They will also be performing for friends and family at DCES Thursday, December 15 at 6 p.m. The school’s annual Wonderland Gift Shop will be open for students to purchase holiday gifts the week of December 5. The students and staff will be busy at Hartley Elementary School (HES) the next two months. On November 14 the HES food drive began. The winners from the Kids Clothes Closet fundraiser received their reward of Lunch in a Limo on November 17. December 1 is the first day of the Student Council Wishing Tree, ending on December 16. Just in time for the holidays, the HES book fair will be ongoing from December 11–16. At the next PTO meeting Thursday, December 15 at 7 p. m., the kindergarten classes will be performing a holiday program. R.B. 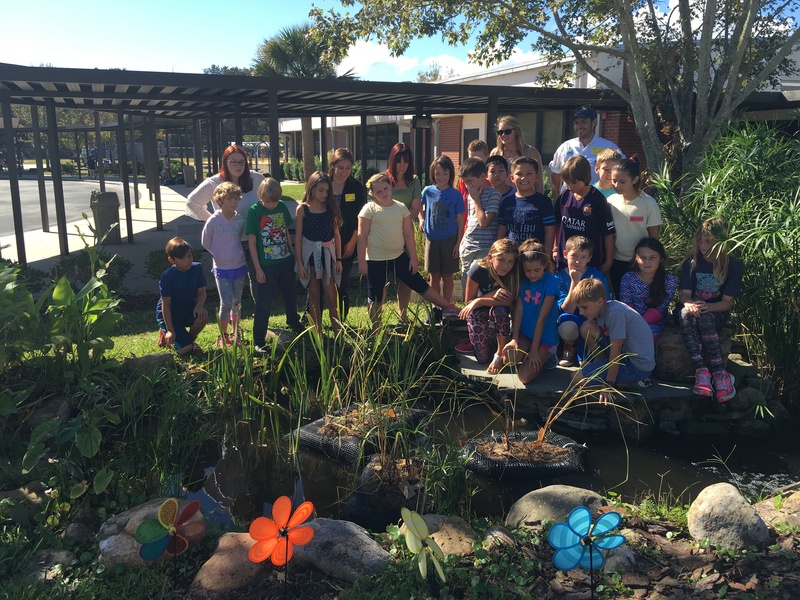 Hunt Elementary School (RBHES) students in Ms. Paolini’s fourth-grade class recently worked with Guana Tolomato Matanzas Research Reserve (GTMRR) and Flagler College to conduct research on growing smooth spartina, commonly known as cordgrass, for use in shoreline restoration. 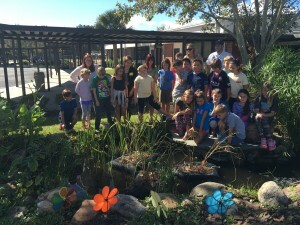 Students participated in creating barges for spartina to be grown in the school’s pond throughout the year. Students will gain STEM-related skills and actively participate in conservation-based research to increase their knowledge and awareness of plant physiology and anatomy, sustainable growing techniques, fresh water chemistry and environmental engineering skills. The spartina barges were built using a frame of tubing and webbing with spartina blooms placed in biodegradable coconut fiber. These barges were constructed by Ms. Paolini’s class under the direction of Kenneth Rainer, education director at GTMRR and professor of Life Science and Science Education at Flagler College along with three Flagler College science students; Britta Messler, Meagan Cooke, Kaley Steinghner. The RBHES students will monitor the growth of the spartina, discuss the variables that would impede growth and chart the statistics. The goal is for the root system in the spartina buds to weave around the coconut bedding and create a large bloom that can eventually be planted along the sea shore. When planted these plants serve as protection from erosion, provide an environment for a several animals as a nursery and acts as a filter for the water. The Julington Creek Elementary School (JCES) community will be conducting a food drive throughout the months of November and December. Students are encouraged to donate food to benefit people affected by Hurricane Matthew in the St. Augustine and Jacksonville areas. JCES students and their families can “adopt” some of our school’s families in need from the Angel Tree and donate gifts to make their holidays a little brighter. The JCES PTO presents the Winter Wonderland Night of Lights on December 1. This is a magical evening event for families that features yummy treats, movies, and lots of fun! Volunteers from Creekside High School’s American Sign Language (ASL) classes have been teaching JCES students ASL. These students will present an ASL holiday program, highlighting different songs that they have learned to sign, on the morning of December 8. JCES kindergarten students will be presenting a holiday program for family and friends on the evening of December 8. The talented JCES chorus will entertain students, families and friends, at multiple holiday concerts on December 13. Their many hours of hard work and practice have led up to this special concert presentation. Earlier this month Liberty Pines Academy (LPA) hosted its annual Liberty Parade honoring veterans. On December 1 and 2, LPA presents its play, “Yes Virginia, There is a Santa Claus” at 6 p.m., and on December 6, the PTO Holiday Vendor/Night of the Arts will be held at 6 p.m. On December 15 LPA celebrates its Leader of the Pack/Character Counts students at 7:30 a.m.
Otis A. Mason Elementary School (MES) held its annual holiday luncheon for all MES families November 17. MES is well into the holiday food drive and is busy collecting non-perishable food items. The donated items, along with a turkey, will be provided in Thanksgiving food baskets to MES families in need. In addition, the MES PTO will be hosting a holiday toy drive during the month of December to support MES families in need. 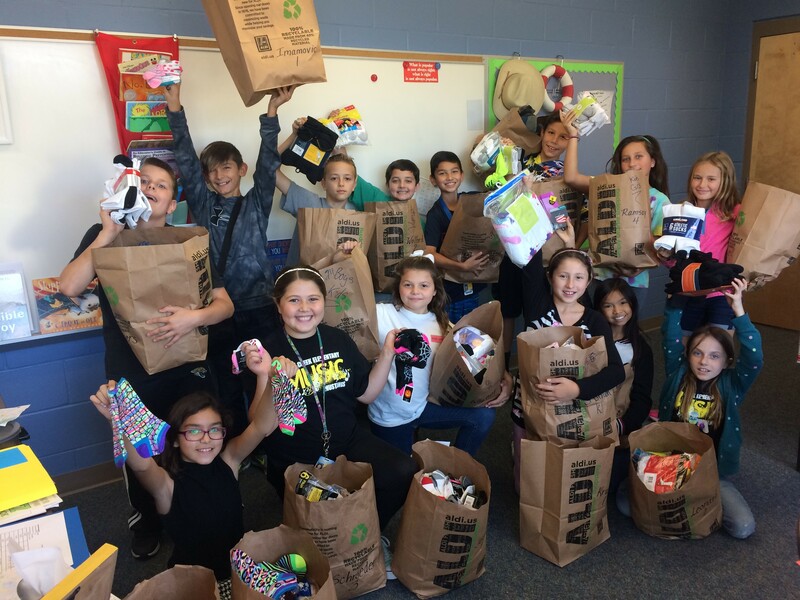 Mill Creek Elementary School (MCES) student council kicked off the year with “Mill Creek Gives Back” campaigns. These campaigns promote giving back to families through clothing donations and a food drive. MCES students are growing up in a world full of data. Counting, graphing and interpreting information around them will continue to be a necessity in their lives. Students have incorporated math with giving back to the community in a way that helps them become confident, selfless, and happy mathematicians. We look forward to the positive influence these lessons will provide throughout the building and the community this year. Osceola Elementary School (OES) Osceola has partnered with Circle K Convenience Stores (formerly Kangaroo) in the “Fueling Our Schools” program during the 2016-2017 school year. For one day in October, Osceola had a designated gas pump at the State Road 312/207 store in St. Augustine. For every gallon of gas that was pumped at any of their pumps during that time frame, 10 cents was donated to OES. There will be four of these special dates this school year and for each date, OES is eligible to earn up to $2,500. In addition, every day during this school year on every gas pump at this location, Osceola will receive 1 cent per gallon pumped. This is an easy way to earn much needed funds, so please share this information with family and friends to support OES school. At Girls on the Run, girls learn about their local community and that one way to show gratitude is by helping others. This season, the OES Girls on the Run want to make a huge impact on the Daniel Organization. Daniel is a multi-service agency that assists more than 3,000 abused, neglected, and emotionally troubled youth and their families. Osceola Girls on the Run is collecting items for children within the foster care program including new pajamas (age 12-18); new undergarments (age 12-18); new socks (age 12-18) ; non-perishable food items; toiletries; coats and sweaters All donations are due by Friday, December 2. OES Girls on the Run will present all donations to representatives from Daniel at their end of season 5K on Saturday December 3. Thank you for all of your help and generosity. On November 22 the Patriot Oaks Academy administration and a couple faculty members will be “slimed” in front of the student body. This was part of the incentive to raise money during our Chargerthon fundraiser which raised over $50,000. A percentage of the money raised was donated to Student Services in an effort to support those impacted by Hurricane Matthew. South Woods Elementary School (SWES) is one of two schools in St. Johns County School District in the process of developing a community school. The Community School directors have been identified and will soon begin reaching out to the community to identify priority needs. SWES is also continuing growth as an AVID school. Students and teachers are focusing on developing student organizational skills and preparing then for future college and careers. 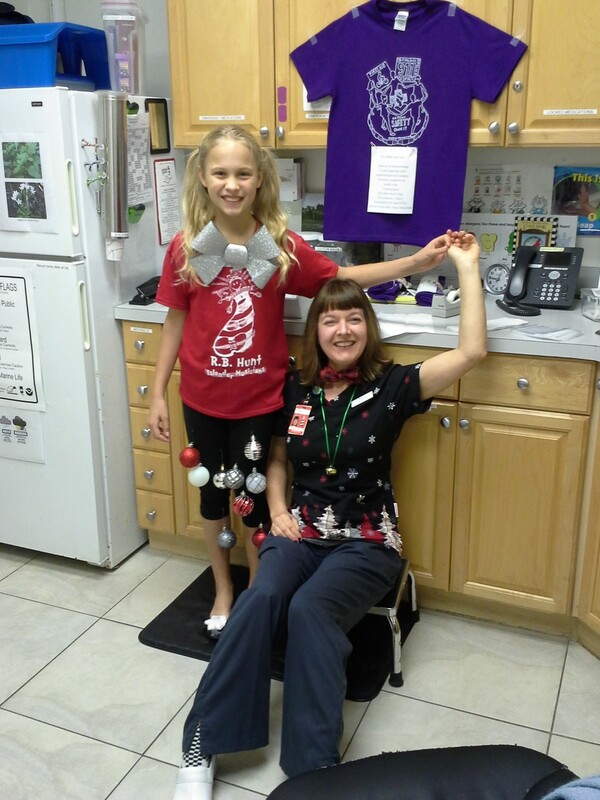 Timberlin Creek Elementary School (TCES) happy to spotlight its CHARACTER COUNTS! Breakfast celebration that was started this school year. Trustworthiness, Respect, Responsibility, Fairness, Caring, and Citizenship. Alone, each of these attributes is considered exemplary; together they form the Pillars of Character that are a part of the culture at TCES. Each month students who show exemplary qualities of the character trait for the month are nominated by their teachers. TCES faculty and administration hosted its second CHARACTER COUNTS! Breakfast on October 27 to recognized students and their parents for showing excellence in Responsibility. TCES is proud to honor these students and to celebrate with their families. Valley Ridge Academy (VRA) will be hosting its middle school CHARACTER COUNTS! celebration Thursday, December 1 and Friday, December 2 for pre-k through fifth grade. Wards Creek Elementary School (WCES) will be hosting second-grade Data and Donuts, student-led parent conferences as well as the kindergarten Poem and Pies that includes a student concert, recitation and desserts on Tuesday, November 22. On Wednesday, December 21 WCES will have its school-wide Winter Wonderland featuring STEM centers related to winter and the holidays. The band students at Gamble Rogers will be performing their Winter Band Concert on December 8 at 7 p.m. The concert will take place at the school. On December 17 the Jazz Band will be performing at the Nights of Lights at 6:30 p.m. at the Night of Lights Trolley Station located at the Visitor Information Center. Holiday Greetings from R.J. Murray Middle (MMS) School Center for the Arts! As students begin to work toward a successful semester, many events and activities are taking place at MMS. The National Junior Honor Society is sponsoring the annual Thanksgiving food drive. All donations will stay local and help support MMS families during the holiday season. Reading Plus and the Jacksonville Jaguars have generously donated 20 tickets to MMS to be used as an incentive for the Reading Plus program. These tickets are for the December 11 game between the Jaguars and the Minnesota Vikings. Three teachers will accompany students to the game and transportation will be provided. In order to participate in the contest, students will need to earn as many combos as they can between now and December 8. Students achieve a combo by scoring 80 percent or higher on two consecutive See Reader lessons. Each time they earn a combo, students will earn a chance in the drawing. The drawing will be held on December 8 and winners be announced at the end of the day. There is no limit to how many times a student’s name can go into the drawing. This wonderful incentive program is an excellent way to motivate and engage your child to improve their silent reading comprehension, vocabulary, and reading fluency. All MMS students are eligible to enter the drawing. MMS dancers performed to standing room only shows at Pedro Menendez High School November 9 and 10. Over 225 students participated in the performances. The advanced chorus and jazz band performed at the Cathedral Basilica on the evening of November 14. It was a beautiful evening with outstanding performances by the students. The MMS chorus will perform on December 5 at St. Augustine High School (SAHS) and the band will perform at SAHS on December 15. Both performances begin at 7 p.m. The drama students traveled to New York City to attend a workshop and performances on November 16. Productions and rehearsals for “James and the Giant Peach” are also underway for a spring performance. Pacetti Bay Middle School band hosted a concert for the community and veterans. Approximately 15 veterans attended in wheelchairs from the Lassen Veteran Nursing Home on SR 16. They recognized all veterans during the performance and handed out flags to all. Sebastian Middle School (SMS) will be hosting a “Art’s Night” on November 30. This is a great opportunity to come and see the progress of our students. On December 2, SMS will be hosting an eighth-grade career fair. This will provide the eighth-grade students the ability to inquire about careers that they may want to pursue in their future. On November 15, the Students Working Against Tobacco (SWAT) members hosted The Great American Smoke Out event in the cafeteria for the staff. This is a chance for the students to reverse their roles and advise the staff what they have learned about living tobacco free. At Switzerland Point Middle School (SPMS), service projects are a huge focus this year. Throughout the second quarter, students at SPMS have been busy demonstrating the Six Pillars of Character by leading a variety of service projects. The SPMS B6 Club spent the month of October collecting treats for troops overseas, designing posters and advertising the collection drive on the daily morning news show, collecting enough candy to send more than 300 bags to soldiers overseas. Meanwhile, students in the Dreams Come True Club got a head start in reaching their goal to help a deserving young child in need by turning leftover Halloween candy into a school-wide fundraiser. The SPMS PTSO helped students organize a highly successful children’s book collection drive in October. Over 1,600 books were donated to students at South Woods Elementary School. Finally, in early November, students and staff participated in our annual food drive, donating hundreds of nonperishable items for those in need in our community. This November, a team of 30 SPMS seventh-grade students will compete in the Noetic Learning Math Contest (NLMC), a semiannual problem-solving contest for elementary and middle school students. The goal of the competition is to encourage student interest in math, to develop problem-solving skills, and to inspire students to excel academically. During the contest, students are given 45 minutes to solve 20 problems designed to challenge and enrich problem-solving experiences. In the spring of 2016, 30,000 students nationwide competed in this contest. Using past contest questions, the SPMS team, with the help of their sponsor, seventh-grade math teacher Tracey Lyons, have been practicing for several weeks. Accolades team members are striving for include a Team Winner Medal for the top team score, National Honor Roll Medals for the top 10 percent of all participants in each grade nationally, and Team Achievement Plaques for the top 10 percent of teams nationally. It is the most wonderful time of the year when the Nease Band and Chorus come together to perform their winter concert. The performance will take place on December 6 at 7 p.m. There a lot going on with the students at St. Johns Technical High School (SJTHS). On November 10 at 8:45 a.m. SJTHS ROTC students participated in raising the flag to honor Veterans Day in the First Coast Technical College courtyard. Congratulations Chef Sherri Gaynor and the culinary students for doing such a great job in organizing the serving of Thanksgiving Dinner to migrant families in the community of Armstrong on November 14. The United Way Board Members were very complimentary of the students’ professionalism and work ethic. On December 9, SJTHS will be hosting a Silent Auction and Parent Night from 5:30-7:30 p.m. Teachers will be informing parents of the upcoming semester exam schedule, studying tips using AVID strategies, introduction to Schoology, and the collaboration between the Culinary and Water Academies’ service learning project, “Grease.” Dinner will be served and items will be available for silent auction. JEA Wastewater Treatment Plant field study for Water Academy students will take place on December 13. Lunch will be provided. B6 Club students will be reading to children and wrapping presents at Barnes and Noble on December 16. A percentage of sales will go to SJTHS Media Center for purchasing books. SJTHS is pleased to offer a second collection day for used cooking oil just for St. Johns County School District (SJCSD) employees. On Wednesday, December 14 from 8 a.m. to 3:30 p.m., SJCSD employees may drop off their used cooking oil in closed containers at the SJTHS campus. For more information, please contact Linda Krepp, career specialist. On Wednesday, January 4, 2017, residents of St. Johns County can drop off their used cooking oil in closed containers, from 7:30 a.m. until 2:30 p.m. at two convenient locations in the County, Francis Field in St. Augustine and the St. Johns County Utilities Wastewater Treatment Plant on Anastasia Island. Sorry, no motor oil can be accepted. This event is planned after the holidays so please start collecting your used cooking oil in closed containers now to help with this drive. All schools and district offices will be closed Wed. – Fri., November 23-25 for the Thanksgiving holiday. In addition, Wednesday, December 21 will be a regular early release Wednesday: Elementary at 1:50 p.m., Middle at 1 p.m. and High at 2:45 p.m.
Over 400 students from St. Johns, Clay, and Putnam county high schools, along with other non-public and non-traditional schools, participated in the second annual High School Showcase held at First Coast Technical College (FCTC) at the St. Augustine campus November 15. 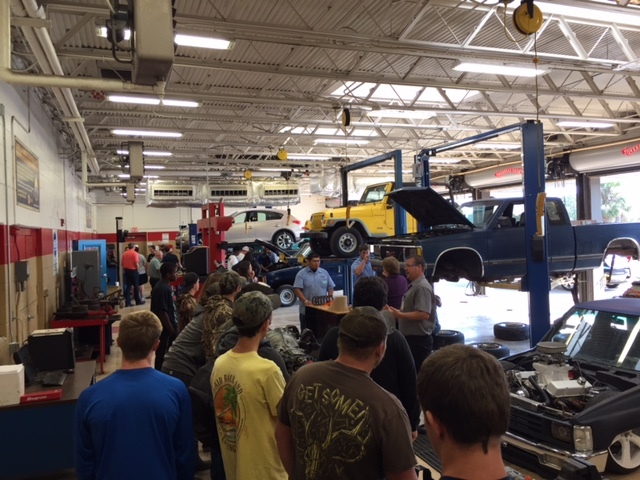 Students were invited to visit two career and technical education programs of their choice and interact with current students and program instructors. Additionally, each program was set up with stations and activities for the visitors to experience what it is like to be a student in the program. The annual showcase is designed to give prospective students a tour of the campus and programs, as well as for current students to share their experiences with visitors. 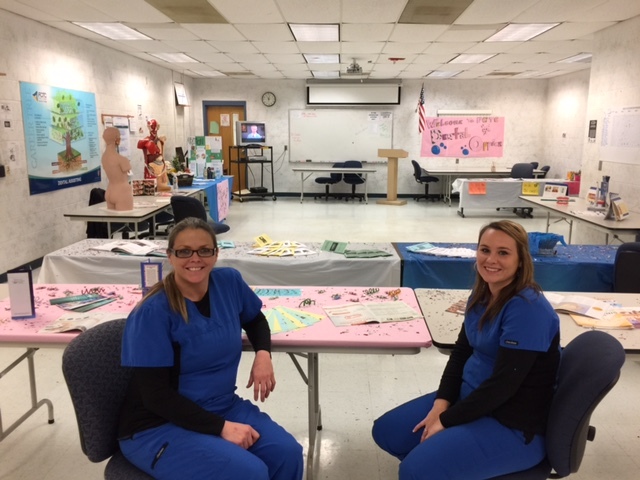 The next step for interested students is the Career Connect Night on December 6 from 5-7 p.m. On that night, students are invited back with their parents and family members to visit their program of choice at one of the FCTC campuses in St. Augustine or Palatka. Students interested in attending cosmetology, LPN, or welding programs in Palatka will visit the Putnam County Campus and those interested in programs in St. Augustine will visit the main campus. Students interested in fire fighting, paramedic, or EMT will visit the Public Safety Campus in St. Augustine. On the Career Connect Night parents and family members have the opportunity to learn about their child’s program choice and get other school-related information including financial aid. Congratulations to Blake Dellenback, of Switzerland Point Middle School, who recently received a $100 gift card, a pen with a flash drive and certificate of achievement from InvestWrite. InvestWrite is a contest that accompanies The Stock Market Game, a virtual investment program. Students work in groups investing virtual money in the stock market with fees and rules they must follow. They track their investments over multiple weeks competing with other students nationwide. The Stock Market Game offers many lessons to use prior to beginning the game that gives the students necessary background information about investing, stocks, bonds and how the economy works. InvestWrite is a summative writing opportunity for students to talk about their experience with the stock market with specific items students need to address such as supply and demand, production, marketing, reasons why this stock will improve etc. One of the stocks Blake’s group invested in was Northrop-Grumman. This was the stock that he chose to write about. This week we take the time to honor our veterans and our schools celebrate them in a big way. Activities include essay contests, art projects, displays, celebrations, parades and storytelling from local veterans, just to name a few. Though Veterans Day is recognized just one day a year, we welcome opportunities to include and honor veterans within our schools all throughout the year. I applaud the effort and thought that our principals, teachers and staff put into highlighting our men and women of service. Be sure to check with your child’s school to see what events and activities may be taking place. As of 1997, federal law mandates that students with disabilities who have an Individual Education Plan (IEP) must begin a process called transition planning at age 14 to help them transition from high school into adulthood. St Johns County School District (SJCSD), The ARC, the Division of Vocational Rehabilitation and the Agency for Persons with Disabilities are pleased to offer Transition Planning on December 13 from 6 – 7:30 p.m. at Creekside High School, 100 Knights Lane, St. Johns, FL 32259. This program is designed to connect students with the proper transition planning services to give them the important skills as well as career planning tools to better prepare them for a successful life after high school, whether it be in a college setting or in the community. The SJCSD itinerant teachers of the Deaf/Hard of Hearing (DHH) have been busy planning the statewide Florida Educators of the Deaf/Hard of Hearing (FEDHH) conference which will be held in Daytona this year. This past spring four of the district DHH teachers were elected to the FEDHH Board: Traci Clark, president elect; Julie Conger, treasurer; Kathy Kelly, secretary; Jessica Mechoso, webmaster. The entire DHH team is working hard to make this conference a success for all professionals and parents of students with hearing loss from across the state. The SJCSD ESE Department is thrilled to announce an ongoing training for staff in American Sign Language (ALS). This training is for teachers and paraprofessionals serving students with disabilities who use ALS to communicate. It is presented in both live and virtual format each month from September through February. In addition a beginner ASL class as well as an extension of the ongoing class will be offered at the February staff training day. Schools have completed the first round of Discovery Education testing, and the next assessment window begins Monday, October 31. Fall EOC testing is complete and grade 10 retakes for both NGSSS Reading and FSA ELA ended October 28. The computer-based testing ran smoothly districtwide. The winter EOC assessment window opens November 28. The student score reports are now available for the Fall NGSSS EOCs and the Fall FSA EOC score reports are set to arrive to the district this week. District high schools held successful administrations of the grade 10 PSAT on October 19. Results are expected by January 2017. District winter final exams are in the last stages of preparation for December administration on the computer-based OLA testing platform. The middle school assessment window begins December 8 and the high school assessment window begins December 16. The Career Academy Showcase will take place on January 19, 2017. All career academy programs will be on display for parents and eighth-grade students to view. The SJCSD is currently reviewing materials for the Florida instructional materials adoption for social studies. The courses being considered for adoption, along with online access information, are available online at www.stjohns.k12.fl.us. 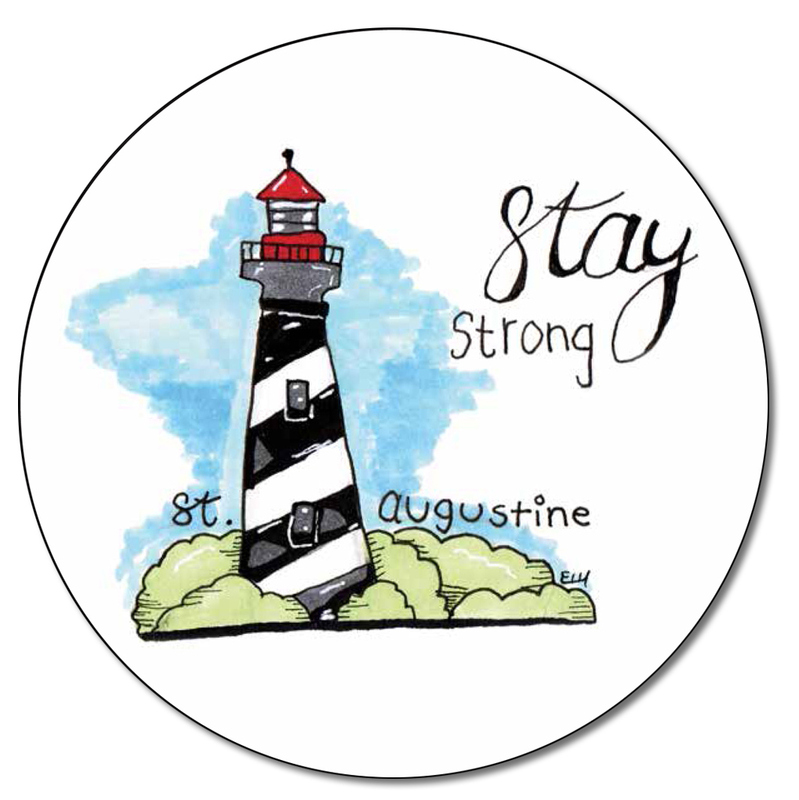 Digital and print materials are also available for examination at The Fullerwood Center, 10 Hildreth Drive, St. Augustine, 32084, from 8:30 a.m. – 4 p.m. weekdays, excluding holidays. This list will be updated if more items are submitted for review. Check the website frequently for updates. Please call (904) 547-3947 for more information. The SJCSD combines district and state funding so that every school has an instructional literacy coach. In order to receive the state funds, the district submits a Comprehensive Reading Plan, which is available at https://app1.fldoe.org/Reading_Plans/. The district visits each school to confirm that the Comprehensive Reading Plan is being followed with fidelity – that appropriate and effective reading instruction is occurring. The directors for elementary and secondary education and the curriculum specialists visit classrooms at each school during the second quarter. Feedback from the fidelity check is provided to the school and can be used to improve instruction. What are the Florida Standards? Health screenings for all kindergarten, first, third and sixth graders are currently taking place. These screenings serve to provide early detection of deficits in vision, hearing, growth and development, and scoliosis. When deficits are discovered through the screening process the school nurse works directly with families through a referral system. This system serves to assist parents in getting their child to the appropriate specialist for further evaluation. School nurses also work with families in need who may need assistance with the cost of physician visits as well as glasses. The Uplift with Aid and Support for Students in Sudden Transition (ASSIST) dinner and silent auction was held October 28 at First Coast Technical College. This annual event benefits SJCSD’s homeless and unaccompanied youth. Hurricane Matthew has increased the number of students needing assistance this year. Heather Crawford, First Coast News, was Master of Ceremonies. Donations to ASSIST are always welcome and can be made through the Investing in Kids (INK) website at ink-stjohns.org. Five Learning Years (FLY) has finished the hiring process for tutors and the BrightStart! program for early literacy is currently in progress at all Title 1 schools in the pre-kindergarten programs. BrightStart! Level 2 is in kindergarten at The Webster School and, most recently, South Woods Elementary. FLY recently attended Epic’s Ancient City Kids Day in an effort to expand its reach in the community and distribute information to young families. The School Services Department has been working at scheduling and meeting with the administrative staff members who handle student discipline at our middle and high school levels. Offering support to assist schools in managing the day-to-day operations is one of the key goals for this department. The district is heading into the final weeks of fall interscholastic athletics, and have several high school teams that have progressed to post-season play. Staff, community, and parental support continue to be outstanding at all of the athletic events. Many of student-athletes across the district reached out to assist families with clean up efforts following Hurricane Matthew. These young men and women are shining examples of the outstanding leadership and character embedded in students throughout SJCSD schools. A quarterly meeting with the safety team task force will soon be scheduled to review the safety plan and evaluate new enhancements and ongoing improvements that may be made. The district school safety coordinator is continuing to meet with school safety teams, looking at maximizing the efficiency of school-based emergency operations plans. He is attending and monitoring lock down, tornadoes, and fire drills at school sites as well. Education Support Professionals Day is Wednesday, November 16 during American Education Week. Education Support Professionals Day was first celebrated in 1987 after the National Education Association called for the creation of a way to honor the contributions of school support staff. The purpose of this observance is to expand awareness of the important role Education Support Professionals play in the lives of the district’s students. Education Support Professionals in the SJCSD number nearly 1,400 including paraprofessionals and those who provide custodial and maintenance services, security services, food services, health and student services, clerical and secretarial services, technical services, skilled trades services and transportation services that enable our students to learn in a safe and academically challenging environment. The members of the St. Johns County School Board have selected Mr. Tim Forson and Dr. Vickie Cartwright as the two finalists for the next Superintendent of the SJCSD. Public interviews with each candidate were conducted Tuesday, November 1 at First Coast Technical College with a community reception held that evening. A School Board workshop was held Thursday, November 3 to discuss the selection process. The School Board will select and vote on a new superintendent with discussion regarding contract negotiations at its November 8 regular monthly meeting at First Coast Technical College, Bldg. C at 9 a.m.
St. Augustine will host a full weekend of Veterans Day events from Friday to Sunday, November 11 to 13. The weekend will begin with the Veterans Day Grand Parade on Friday to honor the military history of the city and all those who served and continue to serve, as well as a three-day Veterans Film Festival of documentaries at the Corazón Cinema, and a special benefit concert by Lee Greenwood at the St. Augustine Amphitheatre on Sunday, November 13. The Grand Parade will begin in front of the reviewing stand at the Castillo de San Marcos at 11 a.m. on Friday, November 11. Over 1,500 marchers are participating in the parade, with veteran and active-duty groups, ROTC units, high school bands, marchers in period dress reflecting the uniforms of all those who have defended the city throughout its long history. There will also be a fly over by vintage WWII planes and current military aircraft. The members of the St. Johns County School Board selected four finalists to be interviewed for the next Superintendent of the St. Johns County School District (SJCSD). Two of these finalists have withdrawn from consideration, Dr. Elizabeth Alves and Mr. Mark Porter. Interviews were originally scheduled for early October, but had to be rescheduled due to Hurricane Matthew. The two remaining candidates, Dr. Vickie Cartwright and Mr. Tim Forson, will be interviewed on Tuesday, November 1 at First Coast Technical College, Building C, 2980 Collins Ave., St. Augustine, 32084. To view the interview schedule for specific times, visit the SJCSD’s homepage at www.stjohns.k12.fl.us and click on the Superintendent Search button. Candidate interviews with the School Board are open to the public. In addition, all employees and community residents are invited to a community reception for the finalists on Tuesday, November 1 at 6 p.m. at First Coast Technical College – Building C, 2980 Collins Ave., St. Augustine, 32084. Attendees will have the opportunity to hear from and meet each of the finalists as well as provide input to the School Board for consideration. The Final Public Hearing for the purpose of adopting the 2016-17 millage and budget took place on September 13. Budgets have since been updated for carry-forward funds, and we are now in the review process. The budget book as approved by the Board can be accessed on the district’s transparency webpage at www.stjohns.k12.fl.us/transparency/. Property inventories are completed throughout the district each year. Property delegates have been identified at each school and department, and inventories will take place this fall. This includes an inventory of the district’s newest addition – First Coast Technical College. Bids, RFPs and formal quotes provide a resource for district schools and departments to maintain and enhance classrooms and facilities. To obtain the best value for various goods and services, the district released over 40 competitive solicitations in 2015. To encourage participation in the competitive solicitation process, the Purchasing Department in partnership with Facilities and Operations, hosted a “How to Participate in Competitive Solicitations” training session earlier this year. The presentation can be viewed at www.stjohns.k12.fl.us/purchasing/business/. The Annual Aid and Support to Students in Sudden Transition (ASSIST) fundraising dinner and silent auction will be held Friday, October 28 from 6:30–9:30 p.m. at First Coast Technical College, located at 2980 Collins Ave. in St. Augustine, to celebrate the perseverance of homeless students and families in St. Johns County schools. The Master of Ceremony will be Heather Crawford, First Coast News Anchor. A $25 donation is requested. To register please visit www.ink-stjohns.org/assist/. For more information call 547.7593 or email [email protected]. Liberty Pines Academy will be hosting its annual Liberty Parade and celebration to honor veterans and service men and women on Thursday, November 10 at 9 a.m. CHARACTER COUNTS! of St. Johns County held its annual Community Breakfast to honor school business partners and sponsors of the CHARACTER COUNTS! initiative on October 19 at First Coast Technical College. The following eighth-grade students were recognized for exemplifying the Six Pillars of Character. The CHARACTER COUNTS! Community Service Award was presented to Flagler Hospital for its generous support of CHARACTER COUNTS! and their continued support of the school district. Nigel Pillay, principal of Otis A. Mason Elementary School, was presented with the Marjorie Davidson Individual Service Award for his steadfast commitment to CHARACTER COUNTS! in his school and as a leader on the steering committee. We are fortunate in our district that our calendar is developed to significantly exceed the number of required instructional hours. For this reason the three make-up days needed for Hurricane Matthew will be absorbed by the existing time we have within the school day. There will be no holidays or teacher planning days used to make up this time. The 7th annual Holly Jolly Shopping Spree will be held on Saturday, November 19 from 9 a.m. to 3 p.m. Gifts, holiday decorations, and other special treasures will be there for the picking. It’s also an opportunity to support local Uptown businesses who so generously support our community. From The Old Jail, you’ll catch a sightseeing trolley (Old Town Trolley Tours) for a journey designed specially for you—a whirlwind shop-a-thon that meanders from along San Marco Avenue, with lots of stops along the way. Brunch will be served by the Raintree Restaurant with a chance to win raffle prizes (sponsored by Spanish Dutch Convoy, Leather Goods & Bags) and bid on silent auction items. Ticket price is $50. The cost includes a trolley ride, brunch, swag bag (sponsored by Spanish Dutch Convoy) samples, silent auction, raffle, and special offers from our community retailers. Checks are payable to Colonial St. Augustine, memo: HJSS and can be mailed to P.O. Box 1408, St. Augustine, FL 32085 by November 15. Event is limited to 300 guests, so make your reservation early. If you have questions, please call Holly at (904) 495-5292 or Michelle at (904) 824-8053. A portion of the proceeds from this event will be used to award scholarships to “Ancient City Explorers (ACE)” an interactive history camp for elementary school students. ACE is a program offered by the St. Augustine Lighthouse and Museum. On behalf of the school district, I want to offer my prayers and heartfelt concern for all those impacted by Hurricane Matthew. This weather event has been like no other and has affected everyone in our community in some way. As I drove the coastline checking on schools yesterday, I was astounded by the devastation to our community. It is important to us and to all of you that we return to a measure of normalcy for our children, consequently we focused on opening schools as soon as possible. As I visited schools yesterday, I saw the smiling faces of children, happy to be back and anxious to tell me about their experiences. I cannot thank Governor Scott enough for prioritizing the restoration of power to our schools. Governor Scott and Commissioner Stewart were in constant contact with me and were able to provide rapid responses to all of our issues. I also want to thank our district leadership team and support staff for their unselfish dedication to our shelters and school facilities while many of them faced their own personal challenges. Many of our staff lost their own homes yet remained to assist the neediest in our community. The overall leadership of Tim Forson was exceptional. As many of you know, we opened eight shelters for evacuees and were responsible for their care during a four-day period. Included in these shelters were special needs for the medically fragile and two pet friendly shelters. Al Pantano and Logan Lowery coordinated transportation for evacuees and for their needs including transportation, cots, food, water, bedding and anything else that was needed. Over 70 of our buses and bus operators were actively involved throughout the event. Paul Rose, our executive director of Facilities and New Construction, was a constant presence, providing leadership and support the entire time not only to our schools but to community members as well. To watch him making on-demand decisions to assist others was one of the purest examples of servant leadership I have ever seen. David Lee, director for Maintenance, responded to countless calls for assistance and support at our shelters prior to, during and following Hurricane Matthew. Sean Prevatt, our director of Food and Nutrition Services, coordinated food to shelters and then made sure our schools had deliveries and were able to provide our children a nutritious meal when they returned to school on Tuesday. Our principals stepped up to the plate unlike anything I have ever seen. The shelter captains, Jay Willets of Pacetti Bay Middle School, Clay Carmichael of Pedro Menendez High School, Traci Hemingway of Timberlin Creek Elementary, Randy Kelley of South Woods Elementary, Nigel Pillay of Otis Mason Elementary, Tina Waldrop of Osceola Elementary, Chris Phelps of Bartram Trail High School, and Amanda Riedl of Mill Creek Elementary, were assisted by every principal and assistant principal who were available to report to our shelters. The same can be said for our maintenance coordinators and food service managers. All members of the Cabinet provided 24-7 monitoring at the St. Johns County Emergency Operations Center, answering questions, making decisions and dispatching assistance during the entire event. Our teachers have unselfishly, and in the face of personal tragedy, prioritized the return to school to provide nurturing care that our children so desperately need at this time. I will be forever grateful to our teachers and staff for the way everyone has stepped up. Our School Board places an emphasis on constructing quality facilities and prioritizing the maintenance of our buildings. This commitment by our board allowed us to re-open after only three days out, and I am grateful. We are currently working to help students, families and staff who are in need, so if you hear of any needed assistance, please contact Director of Student Services Kelly Battell at [email protected]. She is keeping a list of our employees and students upended by Hurricane Matthew. Hurricane Matthew has changed us all. We will rebuild and ultimately be stronger because of it. 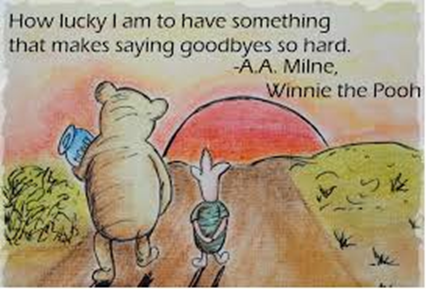 In my 14 years as superintendent, I have never seen such an outpouring of care and I will be eternally grateful. To view the interview schedule, visit the SJCSD’s homepage at www.stjohns.k12.fl.us and click on the Superintendent Search button. Candidate interviews with the School Board are open to the public and will take place on Thursday, October 6 in the Auditorium of the SJCSD Administrative Building, 40 Orange Street, St. Augustine, 32084. Please refer to the interview schedule for specific times on October 6. In addition, all employees and community residents are invited to a community reception for the finalists on Thursday, October 6, at 6 p.m. at First Coast Technical College – Building C, 2890 Collins Ave., St. Augustine, 32084. Attendees will have the opportunity to hear from and meet each of the finalists as well as provide input to the School Board for consideration. The St. Johns County School District is seeking comments on the proposed 2017-2018 and 2018-2019 school calendars at www.stjohns.k12.fl.us/calendar/proposed/. Feedback will be collected through Monday, October 3. The final proposed calendars must be approved by the School Board. St. Johns County School District is proud to have offered three different job fairs to assist filling open positions. Last spring, the Teacher Recruitment Fair at St. Augustine High School was held on April 2, 2016. The focus of the fair was to provide interested educators the opportunity to come and learn more about teaching in St. Johns County schools and to talk with teachers, principals, and assistant principals. In addition, candidates had the opportunity to visit several different informational tables where they learned more about the ESE and curriculum departments, professional development, benefits, certification, teacher evaluation, as well as complete their online application. Attendees not only came from throughout Florida, but from Georgia, North Carolina, Maryland, Pennsylvania, Virginia, and Wyoming as well. There were over 15 schools represented with over 175 teaching candidates attending. The department is currently reviewing the numbers to see how many of those who attended were hired in the school district. Based on the fair’s feedback form, it was indicated that the job fair truly met their needs. Attendees expressed how grateful they were to have the opportunity to meet face-to-face with administrators. In June the SJCSD hosted a job fair for support personnel at St. Augustine High School with over 80 attending. There were 42 registered and 43 walk-ins who came in to learn more about the support positions available in the school district. From bus drivers to mechanics, maintenance workers, custodians, food service, extended day and para professionals, interested attendees had the opportunity to speak to transportation, maintenance, and school-based personnel. One of the district’s most critical need areas is in transportation, so reaching prospective bus drivers and qualified diesel mechanics was a priority. In addition, face-to-face screening interviews were conducted along with giving individuals time and assistance to complete their online application while in attendance. The job fair yielded some viable candidates for the positions that were open or would become open during the summer months. The job fair was well received and attendees appreciated hearing more about the positions available and receiving job descriptions. In July, the Fullerwood Center was filled with associate teacher applicants as they attended the first St. Johns County School District Associate Teacher Expo. With over 132 registered attending, school administration teams took advantage of interviewing on the spot to fill current and upcoming associate teaching positions. The event allowed principals and administration teams to have face-to-face interviews with a rotating interview schedule using a ticket method. At the end, principals were able to make their recommendations and over 10 applicants were recommended for positions. The fairs were overwhelmingly successful as they gave applicants the opportunity to meet face-to-face with school and department administrators and supervisors. The district’s recruitment team will be debriefing on each of the fairs held and look forward to hosting future fairs this spring and summer to help fill vacancies in the school system. With the continuous growth the St. Johns County School District is experiencing, this is certainly one way to recruit the best teachers and support staff to work with our students, teachers and administrators. Did you know that the school district is the largest employer in St. Johns County? This year the district’s student population grew to over 38,000 students. The SJCSD currently employs 4,438 employees. It has been a busy summer for Human Resources as the department worked with schools and departments to hire new teachers, support staff and administrators to meet the demands of the new growth. To date 372 teachers and 207 support personnel have been hired. These numbers include positions where teachers or support staff have retired or resigned. The St. Johns County School District has partnered with Marathon Health, Inc. to provide health and wellness services to our medical plan members. These services are administered at three locations throughout the district, the O’Connell Wellness Center, the Nease Wellness Center and the Pedro Menendez Wellness Center. The centers are staffed with three medical doctors, a nurse practitioner, two radiologic technicians and four medical assistants. Marathon Health provides health management services including primary care, acute care, health assessments, lifestyle coaching, and chronic condition coaching. The Marathon Health model provides participants with a different way to think about health by offering the tools and support to help members take more responsibility for their own wellbeing and healthcare. The Annual Aid and Support to Students in Sudden Transition (ASSIST) fundraising dinner and silent auction will be held Friday, October 14 from 6:30–9:30 p.m. at the Northeast Florida Regional Airport Conference Center to celebrate the perseverance of homeless students and families in St. Johns County schools. The Master of Ceremony will be Heather Crawford, First Coast News Anchor. A $25 donation is requested. To register please visit www.ink-stjohns.org/assist/. For more information call 547.7593 or email [email protected]. October 17 will be regular school day to make up the school cancellation on September 2. October 17 was originally scheduled as a student holiday and teacher planning day. The Florida Department of Transportation (FDOT) is proud to announce a system-wide update to Florida’s 511 Traveler Information System; with a new mobile app, website and phone system geared to enhance the user experience.Florida’s 511, the state’s official source for real-time traffic and travel information, has added state-of-the-art features across all of its platforms while continuing to provide incident, construction and congestion information on all of Florida’s interstates and toll roads, and other major metropolitan roadways.The new, mobile-friendly website features driving directions, point-to-point travel times, and alternate routes, alongside the traffic information to which users are accustomed. FDOT is also introducing weather forecasts and severe weather alerts supplied by the National Oceanic and Atmospheric Administration (NOAA). The innovative new “My Cameras” feature allows registered users to store a list of traffic cameras that provide an important, live look into the conditions along their route.The new Florida 511 mobile app features turn-by-turn navigation, with real-time traffic updates, alternate routes, and improved travel times on roadways, along with all of the added features coming to the new site, while the updated phone system will provide more streamlined call navigation menus, getting you to the information you need more efficiently.Know before you go! Keep Florida moving with the new 511! Ripley’s Believe It or Not is offering all K-12 teachers and district staff free admission to their attractions from September 6-October 16. Participating attractions include Ripley’s Believe It or Not! Odditorium, Red Train Tours, Bayfront Mini Golf and Ripley’s Ghost Train Adventures. Bring a current pay stub and photo ID to receive free admission. Employee can bring up to five guests who will receive 50% discounts on their admission. Flagler College is now taking applications for the Public Administration Degree program. SJCSD employees have a unique opportunity to earn a bachelor’s degree. It is exceptionally affordable, high quality, and conveniently scheduled. Due to the Florida Resident Access Grant, which you will qualify for by being a Florida resident, total out of pocket tuition for SJCSD employees is only $600 for the entire 2016-2017 academic year. For students staring in January, it would be $300. Flagler College offers this opportunity as a community service. Students can complete their bachelor’s degrees in just five semesters. The college accepts working professionals from the public, private, and non-profit sectors who have their A.A. or A.S. degrees or who have 60 transferable college credit hours from a regionally accredited college or university. The Public Administration Degree program teaches the subjects and skills needed for success. For information on our curriculum and faculty, please refer to the program’s web page at www.flagler.edu/PAD. The St. Johns County School District announces the schedule of 2017 graduation ceremonies for St. Johns County high schools, St. Johns Virtual School and First Coast Technical College (FCTC). Construction of new elementary school “M” in World Golf Village has begun and will be completed for the opening of the 2017-2018 school year. The K-8 schools in Nocatee (KK) and Aberdeen (LL) are scheduled for construction to start this month with projected openings for the 2018-2019 school year. The major expansion project at Allen D. Nease High School is underway and on schedule. Site construction for the new bus loop and two-story building addition is in progress with projected completion for the 2017-2018 school year. Upgrades to existing utility management systems have been installed at Ketterlinus Elementary School and Liberty Pines Academy. The installation of these upgraded systems allows the school facilities to run more efficiently saving the district on utility costs. These systems are more cost-effective when powering all HVAC and lighting systems throughout the schools. The Maintenance Department assisted district maintenance managers with preparing their schools for reopening by completing many routine maintenance requests and repairs where necessary. The Preventive Maintenance (PM) teams began their annual two week visits to all sites, beginning with Ketterlinus and Timberlin Creek elementary schools and Landrum Middle School. In addition to the PM site visits, the maintenance team Peer Review Committee began their site visits on August 24 at Patriot Oaks Academy. The Transportation Department is currently operating 175 school buses to transport approximately 21,500 student riders each day. Recently the department added 16 new school buses to serve the children of St. Johns County. Areas of safety with special emphasis for the department include safe bus stop procedures, seat belt use by student riders and increased awareness of young riders, notably kindergarten students. Transportation continues to recruit high quality personnel to serve as bus operators and attendants. Anyone interested in career opportunities with the Transportation Department should contact Mr. Bob Aponte at 547-8814. SJCSD evening Community Education courses provide convenient, affordable learning opportunities at school locations around the county. New courses are now posted and available at Patriot Oaks and Valley Ridge academies, Osceola and Mill Creek elementary schools, St. Augustine High School, the Lincolnville Excelsior Center and the Fullerwood Center. Courses include Cooking: Make It and Take It; Microsoft Office; Microsoft Excel; Memory Improvement; Real Estate: For Sale by Owner; Conversational Spanish; All About France; Body Sculpting; Fundamentals of Drawing and Painting; Photography; Sewing; Ashtanga Yoga; Guitar; Clawhammer Banjo and Bluegrass String Band. Classes begin soon and meet once or twice per week for 1-2 hours and run from 2-8 weeks. The cost is from $8-$10 per class hour. Funds generated by the program help support the host schools. For information or registration, go to http://communityed.stjohns.k12.fl.us/ and click on courses or call 547-7565 or at 547-7510. 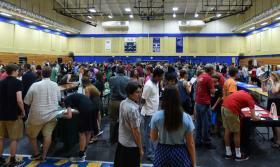 The St. Johns County School District held its annual College and Career Night last week in the gymnasium at Pedro Menendez High School. The event offered information and opportunities from the nearly 100 college, career, trade and military recruiters who were present. Hundreds of students packed the gym to see what might spark their interest and start planning for the all important decision of life after high school. September 11-17 is National Arts in Education Week. The arts are an essential part of a complete education, no matter if it happens in the home, school, or community. Students of all ages—from kindergarten to college—benefit from artistic learning, innovative thinking, and creativity. Celebrating National Arts in Education Week is a way to recognize this impact and share the message with friends, family, and communities. Proclamation was read at the School Board meeting Tuesday, September 13 in honor of National Arts in Education Week. Learn more at www.americansforthearts.org. Congratulations to Cynthia Williams, principal of St. Johns Technical High School (SJTHS) and St. Johns Virtual School (SJVS), who has been selected as the St. Johns County School District’s (SJCSD) nominee for the 2016-2017 Principal Achievement Award for Outstanding Leadership and to Jeanette Murphy, assistant principal at Cunningham Creek Elementary School (CCES), who was chosen as the district’s nominee for the 2016-2017 Outstanding Assistant Principal Achievement Award. These programs honor principals and assistant principals who utilize teamwork and leadership skills to increase student performance, establish partnerships with parents and community members, and promote safe learning environments. Awardees are also recognized for ethical leadership and their use of innovative technology as well as their commitment to forging personal, social, economic, and cultural relationships in the classroom, the school and the community to build and support a learning organization focused on student success. Williams has been the principal of SJTHS since 2014 and was appointed as principal of SJVS in 2016. With a career in education spanning 27 years, Williams has served as the turnaround specialist and assistant principal at SJTHS and assistant principal at Pedro Menendez High School and South Woods and Hastings elementary schools. From 1995-1999, she was the guidance counselor at Hastings Elementary School. She was selected as the St. Johns County Teacher of the Year in 1998 and went on to represent the district at the state level. She also worked in higher education supporting students in their quest for academic success at Florida A&M University (FAMU) and Bethune-Cookman University. SJTHS has expanded programs under Williams’ leadership and she never misses an opportunity to market the school to potential students and their parents. She was instrumental in adding sixth grade to the school in order to serve more students in a way that meets their career goals and learning styles. The graduation rate of SJTHS students has nearly doubled under her tenure and she implemented the Academy of Culinary Arts last year. Williams holds a bachelor’s and master’s degree as well as certification in Educational Leadership from FAMU. Outstanding Assistant Principal Nominee Jeanette Murphy has over 19 years of combined educational experience. Before joining St. Johns County in 2004 as a middle school math teacher, she was an elementary school teacher and reading specialist in Miami-Dade and Broward counties. In 2008, she became the assistant principal at John A. Crookshank Elementary and went on to serve in this capacity at Fruit Cove Middle School before joining CCES in 2015. As an assistant principal Murphy has developed and guided a team to review and create a standards-based grading policy and served as a mentor to other assistant principals. Her love of professional development has spurred her to form a leadership cadre, perform technology demonstrations and create professional learning communities for paraprofessionals and new teachers. These two St. Johns County nominees have been forwarded to the state where they will compete at the regional level. The statewide winner in each category will be announced later this year. The first two weeks of October are designated as Disability History and Awareness Weeks. Florida Statute Section 1003.4205, Disability History and Awareness Instruction, was signed into law in 2008. It requires school districts to designate the first two weeks of October as Disability History and Awareness Weeks and promotes providing instruction for students in all public schools to expand student knowledge, understanding, and awareness of individuals with disabilities, disability history, and the disability rights movement. The Intervention Services Department has recently provided training to more than 10 assistant principals who are new to the LEA role in their schools. Training and support will continue through one-to-one and on-site training throughout the year. Additionally, nearly 50 principals, assistant principals, and district program specialists attended the LEA refresher training where updated tools were provided to start the 2016-2017 school year. Both of these training opportunities included a focus on facilitated IEP meetings as well as state and federal compliance rules related to ESE and Multi-Tiered Systems of Support (MTSS) processes and procedures. In addition, participants also benefited from a review on addressing dyslexia in the public school system. Discovery Education testing is required for K-3 students. The test is available to students in grades 4-10 for use as a progress monitoring tool. The testing window opens on August 22 and closes on September 30. All elementary and K-8 schools have created schedules, trained test administrators, and recruited proctors for this first round of required testing. If you are interested in volunteering at your student’s school, please contact your school’s testing coordinator to see how you can get involved. The state assessment conference will take place in a couple of weeks. This conference is the main forum for dissemination of information related to all of the major state assessment policies and outlines important changes and updates. Members from the SJCSD Planning, Accountability, and Assessment Department will attend and return with important information to share with school administrators and school testing coordinators. It is vital that St. Johns County school leaders are kept apprised of these details as they guide students and schools for the coming year. Students in kindergarten, first and second grades will be building foundational skills in early literacy development through the implementation of the “Being a Reader K-2” program beginning this school year. “Being a Reader K-2” is a literacy resource developed by the Center for the Collaborative Classroom based on extensive research. The Center for the Collaborative Classroom also developed “Being a Writer,” which was implemented in SJCSD elementary schools last year. Both programs are based on best practices and support the development of the whole child while addressing social-emotional needs in tandem with reading and writing instruction. This is a proactive step in meeting the early literacy needs of every elementary student in St. Johns County. As a new school begins, parents eagerly ask their children about school. Being informed about what students are learning is an easy way to begin conversations. Parents will find the Year-at-a-Glance for courses – elementary, middle and high school – on the Families tab of the district website. The Year-at-a-Glance provides recommended pacing and topics to be taught week-by-week. The classroom teacher is always the best source of information regarding content and pacing, but the Year-at-a-Glance is supplied as a model of one recommended path to the completion of a course. The Year-at-a-Glance is available at: www.stjohns.k12.fl.us/year-at-a-glance/. Some state resources are provided below. As the new school year begins, educators, parents, and students are encouraged to visit the state CPALMS website at www.cpalms.org, where standards for each course and many student resources are housed. The website www.FloridaStudents.org is also a valuable learning resource available 24/7 to students, educators and parents. It is a great tool to help students improve Florida Standards mastery levels. The Mathematics Formative Assessment System (MFAS) provides ongoing feedback to teachers that can be used to adjust instruction to meet students’ specific learning needs. Like all formative assessment, MFAS is a process rather than a test. The MFAS has resources for mathematics – kindergarten through Geometry and can be accessed through CPALMS. Teacher toolkits provide assistance for teachers in state assessed areas and are now available on the Florida Department of Education website on the standards and instructional support page at www.fldoe.org/academics/standards/toolkits. Once again, Governor Rick Scott and First Lady Ann Scott have invited all Florida students to participate in the 2016 Hispanic Heritage Month art and essay contests which will be centered around the theme, “Honoring Hispanic American Heroes: Veterans, Military, Law Enforcement and First Responders.” Students in grades K-3 have a chance to win a cash prize by submitting artwork, and students in grades 4-12 can earn a four-year Florida Prepaid Scholarship through the essay contest. Students can read about Hispanic Americans and the significant contributions they have made to Florida’s diverse history. Students can then write an essay or create artwork for submission to the contest. The prizes could transform the life of a student. Please encourage your student/child to take full advantage of this opportunity to enhance their appreciation for Hispanic American History and prepare financially for their own future education aspirations. Additionally, students, parents, teachers and principals are invited to nominate full-time, Hispanic American educators in elementary, middle and high schools for the Hispanic Heritage Month Excellence in Education Award. The deadline for all submissions is 5:00 p.m. Eastern on Friday, September 9, 2016. To learn more about Florida’s Hispanic Heritage Month celebration and contests, visit www.FloridaHispanicHeritage.com. Nominations/applications for the Presidential Awards for Excellence in Mathematics and Science Teaching (PAEMST) will open to teachers of grades 7-12 in the Fall of 2016. These are the nation’s highest honors for teachers of mathematics and science. Awardees serve as models for their colleagues, inspiration to their communities and leaders in the improvement of mathematics and science education. Elementary and secondary categories alternate each year. Since 1983, more than 4,400 teachers have been recognized for their contributions in the classroom and to their profession. If you know great teachers, nominate them to join this prestigious network of professionals. Teachers may be nominated or apply at the PAEMST website at www.paemst.org. During Summer 2016, the Career Academies had 74 high school juniors interning at more than 35 business sites listed below. The district is very grateful to the business community for their support of our students. The Rotary Club of St. Augustine donated over $6,000 to the Health Services Department to provide a rolling emergency medication cart for each school clinic within the district. The number of students with life-threatening health conditions requiring emergency medications at school continues to grow and the need for appropriate storage and accessibility of these medications can be challenging. Thanks to the generosity of the Rotary Club each school will not only have a safe place to store emergency medications, but also a method for transporting them during emergency evacuations. The School Services Department has been providing training at several of schools presenting the benefits of using online software for discipline referrals. To date, almost half of our schools are utilizing this very efficient piece of the student management software. The district Safety Coordinator is attending the monthly meetings, held by the St Johns County Emergency Operations Center, to participate in discussions reagrding hurricane preparedness. The coordinator has also been attending School Safety Team meetings and assisting in updating school Emergency Operations Plans. Beginning this year, the coordinator will be observing fire drills, tornado drills, and lock down drills at each school in order to provide assistance with best practices in ensuring student and staff safety across the county. A video of Superintendent Dr. Joyner’s presentation to the county high school coaches and athletes at the annual Pursuing Victory With Honor in-service training is now available online at www.stjohns.k12.fl.us/schoolservices/athletics/ Dr. Joyner’s contributions in instituting the Pursuing Victory With Honor program in St. Johns County Schools and athletic programs have been remarkable to say the least. His pursuit to bring heightened awareness to character and leadership to both coaches and students will remain a focus long after his retirement. As the nation’s largest provider of assurance, tax and consulting services focused on the middle market, RSM partners with the Davis Love Foundation, the host organization of The RSM Classic, a PGA TOUR event, to raise funds that assist children and their families. The RSM US Foundation will be providing a potential match of up to $500,000 for the funds raised by Birdies Fore Love, provided that RSM meets its regional fundraising, partner participation and employee participation goals. These funds will be distributed amongst the Birdies Fore Love charities, including INK. The St. Johns County School District (SJCSD) will hold its annual College and Career Night on Wednesday, September 7 from 6 -7:30 p.m. in the gymnasium at Pedro Menendez High School located at 600 State Road 206 West, St. Augustine, FL 32086. College and Career Night provides an excellent opportunity for St. Johns County high school students from all public and private schools throughout the county to interact with admission representatives from across the state and the nation. Representatives from over 75 colleges, universities, , career institutes, trade schools and the armed services will be participating in this event. Families will find an increased presence of representatives with a focus on meeting students’ diverse needs and desires in all areas. Between 5 and 6 p.m., mini workshops addressing topics such as the college application and selection process; financial aid; scholarship opportunities for academics, athletics and needs-based as well as career exploration and certification opportunities will be provided. While juniors and seniors are strongly encouraged to participate, the event is open to all middle and high school students…it’s never too early to start exploring and planning for your future! Look for College and Career Night updates on the department of Guidance and Programs of Choice website at www.stjohns.k12.fl.us/gpc/ or call (904) 547-7754. In addition, there are more ESE parent workshops to be scheduled for the second semester. Information will be coming in future editions of the Superintendent’s Report and on the ESE website. Eight St. Johns County coaches were honored with the Jeff Holt Coach of the Year Award for Pursuing Victory With Honor last month. Congratulations are extended to Tim Krause, Allen D. Nease High School; Frank Holleman, St. Augustine High School; Megan Schooley, Pedro Menendez High School; Eric Frank, Creekside High School; Daniel Villarreal, Ponte Vedra High School; Meghan Jackowiak, Bartram Trail High School; Susan Lucas, Florida School for the Deaf and Blind; and Justin Taylor from St. Joseph Academy. All of the Coaches of the Year will be recognized at the regular meeting of the School Board on Tuesday, September 13 at 4 p.m. in the auditorium at 40 Orange St. The Investing in Kids (INK!) Boot Scootin’ BBQ, a western-themed fundraiser, will be held October 1, from 6:30-10:30 p.m. at the St. Augustine Rod and Gun Club. The event, sponsored by Carlisle Interconnect Technologies, will benefit students and teachers, a true bull’s eye for education in St. Johns County. Enjoy tasty ‘cue from local pit masters—Mojo BBQ Old City, Smokin D’s BBQ and Woodpeckers Backyard BBQ. Ameris Bank and others will satisfy your thirst at the watering hole and guests can whoop it up to the tunes of Paper City Hustlers and learn country line dancing with the St. Augustine Line Dancers. The dessert bar will feature moon pies, old-fashioned banana pudding by Bono’s Pit Bar-B-Q, and perks by Kookaburra Coffee. Rype & Readi Farm Market will host Cow Pie Bingo where the stars of the show—two well-fed cows—will roam the grid. Nearby, RSM will host a Chip Shot Challenge for prizes. Saddle up for Old City Life Magazine Rodeo on a mechanical bull for best male and female first place trophies and city-slicker prizes! Tailgate with Ocean Grove RV Super Center and root for your favorite football team as you watch the game from outside their RV. Guests will be greeted by a themed photo opportunity, silent auction, prize give-aways, a western photo booth by Leonard’s Studio and more.